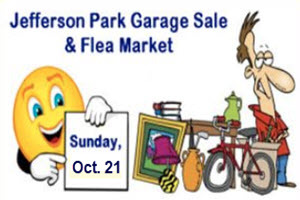 The Jefferson Park Flea Market will be held from 9 am to 3 pm Sunday, October 21, on the parking lot at the Copernicus Center, 5216 W. Lawrence Ave., one block east of Milwaukee Avenue. Multiple Families participate. Lots of great bargains! Rain or shine. To sell YOUR items & become a VENDOR, please call Eva at 773 282-3879 or email [email protected] for an application. The Fee is $20 for 3 parking spaces. Applications can also be picked up from the Nadig Newspaper office located at 4937 N Milwaukee Ave between 9 am – 4 pm or by DOWNLOADING APPLICATION HERE. Optional “3 spaces” use = Park your car elsewhere to use all three spaces for your items. This event is organized & sponsored by the Jefferson Park Neighborhood Association, the Jefferson Park Chamber of Commerce, and the Copernicus Foundation. JPNA has served area neighbors as an outlet for their opinions, interests and concerns. General meetings are held on the last Wednesday of the month at Jefferson Park Congregational Church, 5320 W. Giddings, at 7pm. Everyone is welcome. JPNA has a quarterly newsletter, a website (www.jpna.net), and a Facebook group to share information of local interest. The Jefferson Park Chamber of Commerce is organized to advance the business, civic, and social interests of its members, and to enhance the welfare of the entire Jefferson Park Community. Their top priority is to help neighborhood business grow! You can find them on Facebook at THIS LINK.